Forging(Hada): Forging is refined Itame mixing with Mokume ware where delicate pattern is closing forged and surface is covered with sparkling Ji-nie that generates darkish, delicate Nie lines along wooden grain so called CHIKEI activity. Diffused reflection with a mottled effect of sparkling Nie glitter of Utsuri appears on Hiraji where thick and darkish lines of Nie Chikei parallels appearing a stream of Itame, Mokume and Masame forging pattern. Temper(Hamon): Temper starts with a small Gunome "Yakiotoshi" upper the Hamachi then wide undulating, large Gunome that combines with small Gunome or Tassel shape of Choji and Togari-ha. Boundary line of Nioi-kuchi is tight feeling in general and a bit on soaked Nie of isolated Yubashiri accumulates along Hamon. In the interior, there works with layer upon layer of short lines of Nie "Sunagashi" and long lines of "Kinsen" from base to tip into the distance. The entire temper gives off the impression of dignified manner. Temper of tip(Boshi): Temper of tip has Midarekomi wavy indication,small circle gently turns back deeply. Tang(Nakago): Nakago is in UBU original. Slightly slanting left Katte'Sagari file marks. One peg hole. Double-bevelled (Kurijiri) heel in full. Back ridge of Nakago is flat. The signature in front is chiselled in thick and vigorous character that reads Ō-MICHI 大道 or different pronunciation DAIDŌ. Ō-MICHI 大道 (initial smith name KANEMICHI 兼道) has been said as "the 9th generation of Shizu-saburo KANEUJI 志津三郎兼氏" has been renowned as the most superior maker who equals to KANETSUNE 兼常 and KANEFUSA 兼房 in Mino domain. His posthumous works signed KANEMICHI 兼道 with the date of year ranges from Tenbun 16 (1547) to Eiroku 5 (1562). 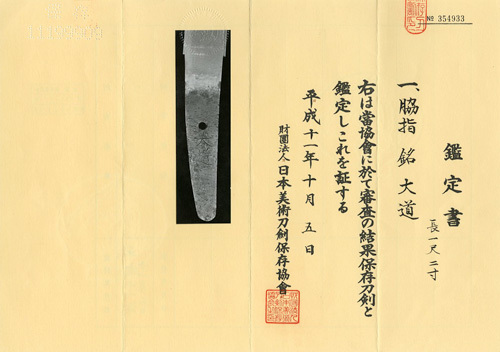 From the reference of DAIDŌ-KI 大道記, he offered the dagger to Emperor Ōgimachi 正親町天皇　on Eiroku 12, Spring (1569) and was granted a word of Ō 大 with the Emperor and official district Mutsunokami　陸奥守 title by the Imperial Court. He had put a honor word of Ō 大 prefixed to his smith name to be Ō-KANEMICHI 大兼道 only a couple of years during Genki era (1570-72) and then put an official title "Mutsunokami"　陸奥守 and changed his smith name as "DAIDO" 大道 on after Tensho 1 (1573). The posthumous works with the date of year as the inscription of DAIDŌ 大道 ranges from Tensho 1 - 19 (1573-91). The places of his studio, initially was in Seki town and later had moved to Gifu and he finally concluded to Kyoto as the founder of Mishina school during Bunrokuk era (1592-95) with his four sons Iganokami KINMICHI 伊賀守金道, Rai KINMICHI 来金道, Tanbanokami YOSHIMICHI 丹波守吉道 and Echunokami MASATOSHI 越中守正俊. The subject wakizashi is full of Samurai majesty spirit that shows the noble dignity during Azuchi-Momoyama perio during Tensho era (1573-91). Ō-MICHI 大道 worked for major powerful clan of Oda Nobunaga 織田信長 who began rise to power. This Wakizashi reminds one of ancient pure Sōshu works from Nanbokucho period such as Hiromitsu or Akihiro. Also impressive superb carvings of rising-descending dragon with a precious orb adds it's artistic value as well. Good polish/Condition scale: mint-excellent (using a scale of mint-excellent-very good-good-fair-poor).